Aero had heard rumors from other rogues that the tribes were different now. Instead of them all being separate, they had grouped up. Instead of seven tribes, there were three. It was strange to hear, different species of dragons are so different it makes no sense how they could even truly align. Then again, her parents had fallen in love and had made her, despite being a NightWing and a SkyWing. Normally, Aero wouldn't care if she was treading through a tribe's territory. Let them find that she was here, at least she was free unlike them. But here, it was strange. In the former stretch between EarthWings and NightWings the earthy scent of EarthWings was mixed with the mysterious one of NightWings. Normally, it was still mixed, but it was just scents drifting from their borders. Now the two clashed, the border between the two erased and combined. Maybe the rogue was right, the tribes had actually combined. There was another scent too, the ashy burn of the FireWings. Aero hadn't spent much time with FireWings, but the rogues that came from their lands still held the scent, even if it was covered by the smell of forests and other rogue-like scents. It was eerie to know that large and powerful tribes teamed up with other large and powerful tribes to create one large and powerful ultra tribe. She wondered if all of the tribes would ever team together and go against the rogues, as by then they'd have no place to live. Everywhere they tread would be part of the tribe, and it would make living almost impossible. They'd probably be forced to join, or else killed or made into slaves. The idea made her shiver. If it was hard enough for a group of rogues to launch an attack on a single tribe, it'd be impossible to wreck havoc on the tribes merged together. She wondered if anyone was brave or stupid enough to try. At this point, Aero wouldn't be one to join in. The dragoness continued to walk, feeling as if someone was going to jump out at her at any moment. Soon enough, a scent drifted towards her maw. Deer. The black dragon's stomach growled; she hasn't eaten for a few days. That should be enough to take her mind off of this impending doom, at least for now. She began to track it, going further into the dragon's territory and most likely doing something they would heavily frown upon. Today was pretty average to start off with. Shiera woke up, stretched, and gussied herself up for the day. She then went out to go prepare a nice meal for Tenebris, as she often would wake up earlier than he did so she could get all the small, daily chores done before he woke up. She’d decided to labor, and make something a bit more extravagant than she usually did. She had made some sauteed bison meat over a wood fire grill, adding some seasoning and a few special ingredients to the mix. After she was satisfied, she finished the preparations, and left it for Tene to enjoy. Once that had been done, she went and finished up the rest of the work she had needed to do. This included doing a quick cleaning of Tenebris’ home. It was rather large, considering his library and him being the king, or whatever the title was Tenebris used to address himself. She was extra careful going through the library, sweeping and flying up to dust the highest reaches of the shelves. After she had been done cleaning the library, she had quickly swooped by and grabbed a book, mostly to occupy herself with later. But her work hadn’t been done with after cleaning. She also needed to organize some papers, and do some manual work out on the grounds. Can’t say she enjoyed the last part of her work. It was rather hot today, and the sun was starting to climb its way up to the highest point by the time she was done with everything else, so that made everything just that much more smoldering. Her fur had been sticking to her sides by the time she had finished, and she had been panting from exhaustion. Now that she had finished her work, she, of course, would go to Tenebris and ask if there was anything else he needed from her. He had dismissed her, thankfully, and the manticore had bowed, thanking him, before going back to her own quarters. It was small, but significantly bigger than her previous living space had been, and also much cleaner. Once she got there, she rushed over to her sleeping space, retrieving the book from where she had stashed it. Gleefully, she’d read the cover to herself. “Maiden’s Keep. A story of the impossible.” It read. Such an ominous ring to it. Recently, Shiera had been getting more into books of fiction, though she had a specific taste of fiction books, and anything else she just found boring. This one, oddly enough, was about humans. Huh, such an odd thing to base your book on, she had thought to herself with a shrug. With the book gripped in her claws, she headed out, running to the courtyard. Once she was outside, Shiera spread her wings, and launched into the sky. Even though it was hot outside, she much preferred reading outside than she did reading inside. She couldn’t explain it, but she just felt so much more immersed when she was outside, comfortable nestled beneath a nice oak, where she could feel the grass and wind against her fur. Made the experience of emerging herself in the fictional worlds much more entertaining. Now, as for where she was planning on reading, she didn’t have a clue. She just let the wind carry her. To most, the NightWing territory was often regarded as mysterious, foreboding, terrifying, scary, and creepy. But to her, she saw it as a gorgeous sea of trees and renovation. Most of what she’d seen of the territory, from her roughly 3 years of servitude for Tenebris, had been nothing but a desire for learning and advancement. The only thing Shiera didn’t like about this land was the magic. The NightWings were infamous for their magic use, after all. Shiera had never understood magic, and she didn’t plan on getting near it any time soon. Shaking her head, Shiera would eye the trees below her, looking for the perfect place to swoop down and read. She eventually spotted a small clearing, and would make her decent, landing on the forest floor with a soft crunch, her paws crushing some leaves that had fallen from nearby trees. With the book having been coiled safely in her tail, she’d walk over to a nearby tree, a tree that had long, sprawling branches, and lots of shade from the heat. Once she had situated herself into a laying position, she placed the book down in front of her, in between her paws, and flipped the pages over to the first chapter. She then began to read. She would read for about two hours. It wasn’t until around chapter 9 that her stomach began growling at her. Shiera closed the book, stretching. Well, that had been fun while it lasted, but now she needed some much deserved time to stretch and run while she went hunting. Sure, she could just go back to Tenebris’, but she had already flown so far to get out here. Plus, the manticore actually loved hunting. It gave her a thrill, and it was one of the few things that connected her back to her past. Placing the book in a place she’d remember to come back for it, Shiera darted off into the forest. For a time, she’d simply run, her ears perked, on edge, listening and smelling for if there was any prey nearby. Then, she picked up the smell. Deer! She grinned. But then that grin turned to a frown, when she realized there was another scent mixed in. There was definitely NightWing, that much was obvious, but there was also two strange smells…. One of them was a trace FireWing, and the other was a dragon smell she couldn’t recognize. She began to slow down, hesitant. Was she close to the border? That was the only explanation she could think of to explain why she could smell FireWings. Then again, who knows. She was still relatively new to all this dragon culture, and only sometimes tried to understand it. With a small shrug, she would keep hunting, though she was now even more on guard than she had been before. The smell of deer grew stronger, almost to the point where it took up all of the dragon's scenes. Her mouth began to water, anticipating the next meal to come. She quieted her footsteps, becoming almost totally silent as she treaded. Soon enough the herd was in her sights, and she determined which one she was going to grab. There were two bucks, one with a bigger rack and the other with half an antler missing, due to a fight or some other circumstances. There were plenty of does, but one caught her attention. It was one of the closer ones, her ears laid back and a hurt expression on her face. She kept one of her back hooves off the ground, and a bite of red could be seen around it. The herd must have been attacked by wolves and she got bitten before being able to escape. The doe might have been able to make it through and continue her healthy years, but if it got infected she would surely die. Aero was just a filter for that. The dragoness bundled her power in her hind legs, keeping her eyes on the doe. She lept, the other deer getting startled and beginning to run around. The doe she had leapt for tried to avoid the incoming dragon, but her leg stopped her from getting too far. The black dragon quickly broke it's back, efficiently killing it. She didn't go after the rest of the deer, this would be enough for now. Sinking her teeth into the deer's neck she began to drink the deer's blood. Once that was done she sank into the meaty parts of the deer and began to eat, hopefully undisturbed. At this point, her muzzle and claws were covered in blood. The dragoness didn't feel like sharing at this moment, and would most likely growl and watch anyone who thought they could interfere. Some crows aligned themselves in the trees, a few of the braver ones on the ground. They'd have to wait until she was done to feast upon whatever scraps she decided to leave. With her tail flicking like a cat's, she watched the crows, nose filled with the scent of blood. The deer was delectable, especially after not eating for a few days. Shiera continued her hunt, following the smell of the deer. The scent was overpowering, which meant she was not only getting close, but that it was a pretty decent herd, which was always nice. That meant she knew there was at least a whole herd of deer within their territory, them being the NightWings. And it wasn’t like this place was all that far from where she lived with Tenebris, so maybe she could come back here again. Maybe she could bring another deer back for Tenebris. He’d like that, wouldn’t he? She asked herself quietly in thought, as she silently swept through the underbrush. Eventually, she would spot a flash of fur, and she’d immediately duck down. Deer. One of the advantages of being small, at least by average Manticore standards, was that it made it significantly easier to hunt than it was for the average NightWing. Dragons were so huge, at least all the ones young Shiera had ever seen, so she always had wondered how they were ever able to sneak up on prey. Then again, the dragons were also probably faster than the average prey, so all they had to do was run after the poor thing. Not only that, but they also had their elemental breaths if things really got desperate. Dragons truly were apex predators. Now she had to focus on staying hidden. The herd was indeed a pretty decent size, with two bucks, and a large assortment of doe to chose from. They were all sort of just splayed about, eating grass, and being generally blissfully unaware of the nearby hunter, as she began to calculate her hunting plan. Shiera, at her top speed, could likely outrun the deer, but she could never be certain. You never know how some species of animals might have evolved in order to avoid death by dragon. Prey animals in dragon territory need to be tough, after all, if they don’t want to die out. First, Shiera picked out a nice, older female. The doe she picked, while she wasn’t limping, certainly carried herself as if she had hip problems. Her fur was also more scraggy and greyish than the does that looked like they were young and fit. The grandma wouldn’t be able to outrun a young manticore in her prime, so obviously Shiera picked that one. Next, she had to wait for the perfect moment to strike. She would begin to dig her claws into the ground, her hindquarters shaking back and forth in anticipation. Her eyes would narrow to slits, counting away the seconds in her brain until there was an opening to pounce. However, there had been one thing Shiera hadn’t taken into account. Apparently, the manticore had been upwind from another predator, which had happened to be stalking the same deer. And suddenly, that predator burst from the shadows. Shiera had been in mid jump, too, when the dragon erupted from the trees, bolting towards a foe on the opposite side of the herd. Instinctively, Shiera recoiled back, her paws digging into the ground in front of her, her eyes widening. Her tail dipped, coiling beneath her underbelly. She knew she had smelled dragon, but she hadn’t realized it had been that close! She gave herself a mental slap, saying to try to be more aware next time, and quickly leaped back into the bushes, ducking down. She watched as the deer ran off, letting out noises of startlement. Shiera even watched the deer she had been eyeing as it sped off. She cursed under her breath. Damn dragon. Maybe she still had time to catch something. She stared at the deer hesitantly, then back at the dragon. Perhaps if she moved fast enough, the creature wouldn’t be able to see her. Besides, she looked preoccupied enough with that deer. The dragon seemed to have its head buried in its meal, with blood visibly leaking down its face. Shiera swallowed, then looked back over at the prey. Yeah, she could probably get it. With quick agility, the lion-like manticore would stalk through the leaves and bushes, following the running doe. She made careful to stay low to the ground, following the creature as it ran. It seemed to be entirely focused on running away from the dragon. Lucky for her, the doe hadn’t yet spotted her, even when she had leaped out, due to it being distracted by the dragon. So, the doe made a wrong turn, which would end up being its undoing. Using speed like lightning, Shiera shot out, pouncing on top of the animal, knocking it over. The deer let out a scream of fear, before Shiera dug her fangs into its throat. It would let out a few last gurgling screeches, before finally collapsing to the floor. Shiera would pick up the animal by the throat, and begin dragging it back to a more concealed area, hoping the dragon hadn’t spotted her when she made her kill. She was still far to close for comfort with the lizard, after all. Aero continued to eat, able to see bones in some areas. Her meal was still warm, although not as warm as it would be if the dragoness had chased after it. She still couldn't tell if this was tribe land or still rogue land, but either way she needed to eat quick and be moving again. Aero was in the middle of taking another strip off the deer when she hear another cry out, before being quickly silenced. There must be another around. The dragoness held her keep closer to her, ignoring the blood that now stuck to her chest. As long as the other creature wasn't something she couldn't handle, Aero wasn't going to loose her kill. After a few moments the black dragon went back to eating. If there was another creature around, then it was smart enough not to mess with her. Eventually, she had her fill, and got up to watch the crows as they swarmed the clean carcass. They would be lucky to find anything salvageable on those bones. She took a second to like a bit of the blood off, but decided that moving was more important. She went in a direction, not having a real purpose in here just to wander. Maybe she'd be lucky enough to find a small pond or lake in this territory and be able to cool off from the sun's unforgiving heat. And she'd be able to wash off the remaining blood. Unfortunately for the manicore, her direction was leading right to her and her newly-caught meal. For a moment, Shiera would be on guard, her ears flicking back and forth, listening for the slightest sound. She had to keep herself on edge, for her own safety. If she were to simply ignore the potential danger, and go straight to eating, then she ran the risk of getting her throat torn out by an enraged dragon. The winged lizards weren't exactly known for taking to manticores very lightly. Even if Shiera did belong to the ruler of this land, it wasn't like some random dragon would necessarily believe that, especially considering the fact her master was nowhere to be seen, and she wasn't wearing anything that would symbolize her enslavement. Luckily for her, though, she didn't hear much from the lizard. In fact, it sounded like the dragon might not have even seen her. Then again, Shiera couldn't know for sure. After all, she couldn't see the dragon from where she was hidden within the trees, so she wasn't able to see her reaction. Though, the dragon was also likely preoccupied with her own meal. Maybe, while she was distracted, Shiera could just peek through the trees real quickly, and then determine whether it was safe to stay put or if she should try to leave. Making sure to be careful, the manticore would stealthily make her way from behind the patch of trees, gazing out at the stranger. It was still sort of hard to see the dragon from where she was positioned, though, from what she could see, it appeared as if the dragon now had her back turned to her. They didn’t even look like they had moved from the position they were sitting in. This brought great relief to Shiera, causing her to let out a small sigh of relief. So, they had either not seen her, or didn’t care enough to come check her out. While this brought partial relief to Shiera, she was still unnerved. She was far too close to the dragon for comfort. Maybe she could just bring the food back to where she had left her book, and eat it there. It would make enjoying her meal significantly less stressful. Nodding her head, she would slowly walk back over to her kill, her ears flicking as the smell swarmed her. The scent was so tantalizing! It would be so simple to just sit down and start eating now. But alas, if she wanted to keep herself safe, she would have to get out of here quickly. Bringing her mouth down to grip the deer’s neck in her mouth, she’d lift it up. It tasted so good, she thought, as she’d taste the blood from the neck wound she had inflicted earlier. Once she had the deer in a comfortable carrying position, she turned, and began walking. However, her body would suddenly tense up when she caught a smell on the wind. Dragon. And it was coming this way. Holding the deer cautiously, she began to look around. Was it the same dragon? It certainly smelled like the one who had attacked the deer in front of her own eyes. The smell was getting closer, and it wasn’t long before Shiera began to hear footsteps. They sounded casual, as if she hadn’t detected the manticore yet. That was good, but why was the dragon all of a sudden up? Had she come to investigate like Shiera had dreaded she would? Or perhaps she had already finished her meal? Whatever the reason, the manticore didn’t particularly want to find out the dragon’s feelings towards her kind, so her eyes began to scan the forest, looking for somewhere she could hide. Perhaps she could just run? Shiera spotted a large oak, and would run over to it, leaping up. With the help of her wings, she was able to coil herself atop one of the branches, hidden in between the leaves. Judging by the way the dragon hadn’t been approaching brashly, and seemed to be taking her time, Shiera guessed she hadn’t smelled her yet. That meant the wind was currently blowing towards her, carrying the dragon’s scent, but not her own towards the dragon. Maybe she could just wait out the dragon, up in the tree. Carefully, she’d grip the deer in her mouth, holding it with her paws, tucked tightly in between the crevice of two tree branches. Her wings were tucked away by her side, and her scorpion tail was coiled around the tree branch she was resting on. Now all she had to do was wait. She’d gently rest her head on the tree, eyeing the surroundings of the forest floor, waiting for the dragoness to pass. What she might not have accounted for was the sudden change in which way the wind was blowing. Nor would she have taken into account the small droplets of blood that would gently drip down and land on the leaves below her leafy hiding space. Aero continued to walk, her nose still blinded by the scent of her meal. Normally, the dragoness would take time to clean herself off after a bloody meal like that, but in this land she wanted to avoid the tribe dragons that might be nearby. She remembered when the NightWings had invaded, taking rogues from the land and forcing them to work for them. How they had brutally maimed Lead and the dragons that worked to try and protect them from the other NightWings. The memory made her shudder. Maybe it would be best if she got out of this territory now that she had eaten, but where would she go? Few rogues had set homes, and she wasn't one of them. The blood from her paws left light tracks in the grass. It seemed almost too quiet around here, there was normally other dragons around, friendly or not. Normally, she would guess that she would smell them before she saw them, but her nose was blocked. There could be a whole patrol watching, waiting for a moment to strike. It was not a pleasant thought, and she hurried her pace a little more. The dragoness had passed many trees on the way, but she halted at one. There was blood on a bush underneath it, and more drops were slowly being added to the forming puddle. Aero craned her head up, peering into the branches of the tree. At first, she didn't think she saw anything, but after another look-over she saw something coiled around one of the branches. She adjusted her angle, trying to get a better look at what it was. Eventually, she could see a flash of tan fur, but other branches were still obscuring her view. Was it worth going after this unidentified creature to find out what it was doing, and where the blood was coming from? Aero glanced around. It was better than nothing. The black dragoness jumped onto the first branch, testing its support of her weight. It may have been easier to fly, but there was no way she'd be able to fly or even peer in the tree without climbing up it. She craned her head again, keeping her eye on the branch where the creature was. Aero was almost certain that it knew she was here, and if it scuttled off then she'd have to follow after it. The dragoness kept slowly climbing up, the branches moving more and more as they got thinner and thinner. Her wings were prepared to jump and follow this thing at anytime, but an attack in here wouldn't be to her advantage. Things seemed to slow down, quite literally. It was as if time was moving at a snail’s pace. Shiera would wait up in the tree, gripping onto the meat tightly. All she had wanted was a quick meal, and she had somehow stumbled into this situation. Just showed you how hostile lands could be, even if you lived in them. Shiera had lived within the NightWing territory for roughly six years, and never once had she felt like she was at home here. It always felt like someone was watching her, especially when Tenebris had allowed her the freedom to wander it by herself. Dragons would eye her, make comments about her, and talk down to her, like she couldn’t understand them. And it wasn’t like lesser species like herself had any safe havens to turn to. The only manticore safe haven she knew of had been destroyed by a patrol of FireWings. Probably claimed it was on their territory. Bunch of arrogant lizards. Even if she ran away, there wasn’t anywhere she could go that guaranteed protection. All the tribes would look down on her as a beast inferior to dragons. While some might not display this idea of superiority in a negative way towards her, it would always mean the same thing no matter where she went. Which was the only reason she hadn’t ran off yet. Well, that and the fact that Tenebris was so nice to her. As the footsteps increased, Shiera opened her mouth a bit, letting the neck of the deer limply fall onto the branch. A bit of blood would bounce off the carcass and drip to the ground, but Shiera didn’t care. She needed to stay focused, and on guard. If something happened, and the dragon appeared to be hostile, then she needed to have both her claws, fangs, and tail ready for an attack. Though, of course, she also had her wings, but there was a high likely hood the dragon could outfly her. 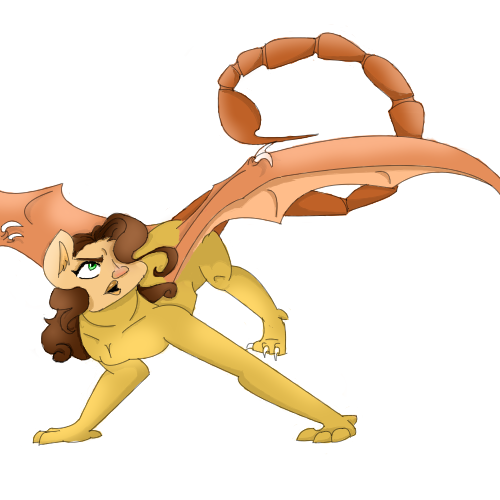 Most dragons were much faster than the average manticore in the air, with even the large and heavy EarthWings having a faster max flying speed than an adult manticore in its prime. Alas, unfair how the world gifted some with abilities that allowed them to conquer the world like the dragons did. Speaking of dragons, Shiera spotted a flash of grey in between the branches. This made her snap out of her thoughts, and instantly grow cautious once more. Under normal circumstances, if Shiera had seen a dragon covered in blood, she likely would have been terrified, especially if that blood was new. But she had seen the dragon viciously rip apart that deer from earlier, so she knew that was where the blood was from. As the dragon would pause for a moment, moving into a position where she could get a better look at it, Shiera swallowed nervously. The dragon was huge! It had to be at least four times taller than she was, maybe five even. Granted, she was very small for a manticore, but still. It was huge and unnerving. Her claws would quietly dig into the bark near by in anticipation, staring down the large reptile. Then, the gray dragon’s head shot towards her direction. For a moment, Shiera’s breath caught in her throat as she locked eyes with the beast. At first, she thought the dragon could see her, as well, but then she realized the dragon’s eyes seemed more clouded over, and unfocused. Then she started forward towards the tree, spreading her wings and leaping up. So she had spotted her! Damn it, how had she managed that? Shiera let out a small gasp, and hiss, as the dragon had sudden made her approach. This hadn’t been intentional, rather, it had just kind of slipped out. An unconscious move. Instantly, the manticore wanted to cover her mouth, but the damage had already been done. How had the dragon even seen her? When she looked down to grab her meal, and possibly make a move to flee, she saw it. The dead deer was dripping blood to a nearby bush down below. The bush had visible blood drops all over it. The dragon must have happened to spot the blood while she had been walking. Curses! The manticore should have just skipped the tree altogether, and just run somewhere the dragon hadn’t been walking to. Maybe then at least, she could have hidden in a tree that wasn’t in such close vicinity to the dragon’s direction. She weighed her options. On one hand, she could leap out of the tree and try to run or fly, but on the other, an adult dragon was a much faster opponent than she was, and if they decided to follow her, they’d catch up easily. Another option was the manticore could try confrontation. The tree was a small space, and thus would be harder for the dragon to navigate, meanwhile the manticore would have the upper hand. Thinking logically, it seemed like the best idea would be to stay in the tree, at least temporarily. So, placing one paw on her kill, Shiera narrowed her eyes, speaking over at the dragon with a voice that seemed territorial, sharp, and to the point, as well as calm, more so than her own body would make you believe, “Who goes there?” she asked simply. Her climb was slow, and she had been more focused on what branch to go to next than the thing that was in the tree. The higher she went the more she felt like the branch was going to break, but she was lucky enough not to have that happen. Her wings scrapped on the other branches, not enough to inflict harm but enough to be a nuisance. If the space wasn't going to stop her, then at least the branches would. Aero doubted she would actually be able to make it up to where the creature was. The dragoness was about to go to another branch when a voice called down to her, or at least she guessed it was her. She looked up, still unable to properly see the creature. Was it a dragon, and one that belonged to a tribe? Aero glanced around, wondering if there was anyone else hiding here. "I'm Dynamic," she carefully replied, "is this your territory?" Looking down, she guessed that it would be a bad idea to throw herself out of the tree if the other decided to attack her for trespassing. Maybe she'd be able to run to the end of the branch and jump from there instead, catching herself and flying rather than going to the ground. The dragoness wondered how exposed she was in this tree. Could a dragon come by and easily see her? A NightWing, or possible an EarthWing? She's prefer an EarthWing to a NightWing, remembering the terrible times with them. She shouldn't be thinking like that in this situation. Maybe the creature was just passing by too? Shiera listened to the cracking branches, as the dragon tore her way up the tree. Each time she’d hear the tree groan and creak under the creature’s weight, she’d wince a bit. Lucky for her, most of the trees in the area were large and sturdy, so even a dragon that was slightly larger than the average NightWing wouldn’t cause the tree to bend or break. Granted, it wasn’t like the dragon was having an easy time getting up the tree, considering all the branches that came across her path. Rather, the dragoness seemed to be having quite a bit of difficulty. Shiera could hear the dragon’s frustration, the way she labored to climb up. It was also evident based on how slow the dragon seemed to climb, gripping her claws into the wood with great concentration. The tree itself would make soft, groaning noises as she climbed, a distasteful sound that resonated each time the gray dragon’s claws dug through the bark of the tree. It made Shiera wince a bit at the splintering sound. At least she had been a tad more graceful when she had made her way up. She was sure it had to be at least a bit awkward, considering how densely packed the branches were together. A big dragon like that, with large wings, probably wouldn’t have the easiest time climbing a tree. Dragons weren’t built for tree climbing, that’s for sure. That’s a cat’s job. But it wasn’t like there weren’t cat-like dragons out there, but Shiera was going to push that idea aside for a moment, just so she could have this. She had to admit, she was relieved that the stranger was having trouble getting up the tree. It gave her a small pinch of victory over the lizards. That was one point manticore, many points dragon…..
Heck, Shiera wasn’t even sure what she would have done were she to have had to ignite confrontation. Would she have fought the dragon off? She had absolutely no idea what this dragon possessed, or even wanted. Which dawned the question, why was the dragon so intent on reaching her? What could a dragon possible want with a manticore? And if she was so motivated, did that mean she was angered with Shiera for some reason? The manticore female couldn’t think of any other reason the dragon, who likely had more important things to be doing, would take time out of their day to climb of a tree after someone like Shiera. It pained Shiera, watching the dragon. Her tail would flick back and forth nervously. All she had wanted to do was eat something, grab a quick meal, and then be gone. She hadn’t asked for this. Having just gone home to Tenebris would have hereld much better results. She nervously bit her lip. Oh, she hoped she’d be able to find her book after all this. She had left it in the forest, buried somewhere. She wasn’t sure what Tenebris would do if she lost it. She’d never lost a book before….. Suddenly, the tree stopped shaking. Shiera’s wings outstretched a bit in curiosity, and she risked trying to get a better look from where she was situated, trying to see more of the dragon from where she was positioned, without giving the animal a clear shot of her. Didn’t want a breath of fire to the face, afterall. The dragon must have heard her call her from above, as she answered her with calling back her name. So, the gray stranger was named Dynamic then, huh? Dragons had such a diverse collection of names. They all sounded exotic and strange to her, but some sounded stranger than others, and Dynamic was certainly an interested one. Shiera adjusted her sitting position a bit, relaxing her haunches, and providing herself a better seat. It seemed she might be up here for a bit, so she might as well, right? She’d also maneuver the deer so that it was resting on top of her left forepaw, but she had her right forepaw on top of the carcass. This way, her meal would be nestled securely in her grasp, but she would be easily able to remove it and escape if need be. When she first heard the dragon, she was about to respond, until she heard the dragon speak again, asking if this was her territory. She paused for a moment, at a loss for words. She wanted to quickly say no, since she wasn’t technically a part of the Nightwings, but something kept her from saying that. Was it pride? No, any trace of that died a long time ago. She was a shell of what a wild manticore might be. A real manticore would be a proud beast, that wouldn’t hide up in a tree like she was. Granted, a real manticore was also much larger than she was. But she was still young, and thus still growing, there was still hope. Unfortunately for her, Shiera knew she couldn’t stay silent forever. Hesitantly, she swallowed, then called back, her voice trying to sound confident, digging deep into that disdain of dragons she once held, and still did, for certain ones, “Yes, this is my territory. What are you doing here?” she asked. Of course she was a bit awkward, because she had never actually owned territory. What did manticores, or dragons, do when someone was on their territory? Threaten them? All Shiera had ever known was being someone else’s property. It was strange, though, that the dragon would ask if this was her territory. It wasn’t like most dragons cared what manticores thought was theirs. It was odd, to say the least. Perhaps the branches obscured the dragon’s vision? Or maybe this dragon just happened to be more polite? Whatever the reason, Shiera believed it was best to just stay up in the tree, obscured by branches, where it was hard to get to her, and hard to see her. It was times like this where the tiny manticore was really glad she was small. Definitely helped in getting her out of sticky situations sometimes. Aero waited patiently for the creatures response. She, or at least the dragon assumed it was a she, had said yes, although she was either nervous or that wasn't actually true. The dragoness decided to save most assumptions for later. She had time, as long as none of the tribe dragons decided to walk by and see her large figure in the tree. A rogue she could deal with, and possible a dragon from one of the tribes, although a tribe dragon might be more of a hassle. The NightWings scared her a bit, especially after that invasion. Most of it was a blur, but she remembered being threatened, the fear and the large IceWing's blood that soaked the ground. The NightWing medic that had tried and helped them and the other dragoness that had tried to help her. The rocks they brought to hold down the IceWing's wings, and the cracks that happened when they placed it down. They were planning on doing the same to her. It was truly a terrifying time. She shook her head. Right now wasn't a time to be dwelling on those events. She had a creature, one that she couldn't identify as a dragon yet, who seemed to be waiting for this to be done with. Another thought poked into her mind. If this really was her territory, then why wasn't she being more defensive about it? Aero wouldn't like strangers in her territory, and while she'd talk instead of fight, she'd quickly shoo them away. Going off of the answer that it was her territory, and not the NightWings or something, the black dragoness asked, "Are you a rogue then?" She assumed that because most tribe dragons would, or should, be more territorial, that they'd address it as their tribe's territory, not themselves. At least, that's what the tribe dragons that she ran into did. Aero had to force herself to keep her wings still in this cramped space, she could already feel branches protruding into the weaker skin of her wings. Not enough to break it though, it wasn't that weak, but it still gave her the extra push to disliking small spaces. Maybe they'd be able to move this conversations somewhere bigger soon, like the ground. Then she could really get a look at this creature. Well, this had certainly been an unexpected morning. All she wanted to do was go out real quick for a nice reading out in the woods, and maybe catch a small bite to eat, and now she was up in a tree, fearing for her life that her assailant wouldn’t be able to tell the truth about her appearance. The dragoness in the tree below seemed oblivious to the fact she was a manticore, and she intended to keep it that way. Shiera had absolutely no idea how the stranger would react, were she to find out that the ‘dragon’ she had been speaking to was no dragon at all, but rather a lesser species. To think, a slave like herself was pretending to be a creature on par with them. She could only imagine the consequences. It made her a bit nervous. What had compelled her to do something like that? Oh yeah, she knew. Primal survival instinct, and a bit of manticore pride. She wasn’t entirely sure how she had managed to maintain that pride, even after all these years of mistreatment and malice. Perhaps it was just an evolutionary trait for Manticores to be stubborn like that. To hold their heads up even when confronted with a life changing situation. Nonetheless, the deed was done. There was no turning back now, especially considering the situation she had gotten herself into. Cautiously, Shiera’d look up at the sky. It was a gorgeous shade of blue. And judging by the color and the position of the sun, it was almost nearing noon. Darn, she needed to get herself back to Tenebris soon. If she happened to be late, and miss her duties, she might not have free reign of the place anymore. Then again, it also posed some challenges. Such as what if she was caught. Not only will she have nowhere else to go, but the dragoness would also find out she was a manticore. Her claws reflexively dug into the bark at the thought, subconsciously splitting through the wood. Suddenly, she heard a loud snap, and her eyes shot wide, her tail instantly coiling around the tree bark. She quickly snapped her head around, searching for signs of the branch breaking. She must be getting too tense. She realized her shoulders were high, her fur was on end, and she was practically glued to the wood based on how tight she was holding on. Instantly, she began to relax. After all, she didn’t want the branch to snap. But from the sounds of it, it sounded like it wasn’t just her branch that had been unstable. Most of the sounds had come from branches down below, where the larger dragon was clinging to the tree. Hesitantly, Shiera looked back down at the gray dragoness. As she looked down, she would notice that the fur on her chest was bare. With an aching feeling in her chest, she realized that her slave collar was missing. Had she left it at home? She didn’t usually take it off. Secretly, she prayed that she wouldn’t run into any other NightWings. If she ran into a NightWing on top of this stranger, she wasn’t sure how she’d handle it. If the NightWings saw a manticore without a collar, they’d assume she was a rogue, and likely try to capture her. The next question the dragoness asked was if she was a rogue. After moving herself into a less tense position on the branch, she’d shoot back quickly. When she spoke, she tried to calm herself, making her voice more regal, sort of like how Tenebris spoke. As one of his most trusted slaves, she had picked up his way of talking. Well, sort of. She at least sounded sophisticated with her way of speaking. Like a butler might. Nevertheless, she was still in a stressful situation, so her voice sounded a bit strained despite her best efforts. “Ah, no, I’m a NightWing,” the manticore exclaimed, wincing, “T-this is my-... I mean our, NightWing territory. Now answer my question, what are you doing here?” she said, adding a bit of growl to the last sentence. She also took a hesitant step forward, to appear more challenging. Of course, she also made sure to keep herself concealed behind the tree branches and leaves. Luckily for her, since she was a slave to a NightWing, she also smelled like a NightWing. Or at least similar to one. Servius Eirene Koinonia moved through the forests that now belong to more of the overgrown lizards than just the EarthWings. He was following a scent, one he had not smelled in decades, one not cloaked in decay. It was unmistakable; the scent was that of a Manticore. A female, in fact. The Manticore stopped, scented the air, his face twisting into a frightening expression one would have thought was a display of aggression. The winged feline continued walking wondering who this female was. Perhaps he knew her as a cub. Perhaps she was the offspring of a later generation. Servius stopped again. He was so focused on the Manticore that he almost missed the Dragon. Their scent was pungent, left a bad taste in The Manticore's mouth. It was in the same direction as the female. He kept moving. Somewhere behind him, the prey animals of the forest breathed a collective sigh of relief. For now, Servius had no interest in them. Eventually the scents became overpowering; Servius was right next to them... so he thought. He looked around. His keen eyes picked up no trace. He made a sort of chuffing noise as he lifted his nose to the air. He realized that his prey was in a tree. The Manticore looked up to see both Dragon and Manticore female in the trees. Why were they there? He smelled no bipeds about for them to be hiding from. Servius opened his wings and lifted himself into the air, hovered in front of the female feline. Now he could see her mouth better. "Why do you hide in a tree?" The Manticore asked in his deep, gravelly voice. Aero cursed the tree for having so many branches. Had it bore less the dragoness could have seen what this creature was, instead of only getting to see flashes of it. She had replied that she was a NightWing, and that this was indeed their territory that the rogue was on. Normally, Aero would take that as her cue to leave, but it seemed odd that a NightWing would decide to hide up in a tree rather than confront her when she was spotted. All of the other NightWings she had meet were rather territorial and would rather show their strength than hide it. And now that she was thinking, NightWings were also rather large. 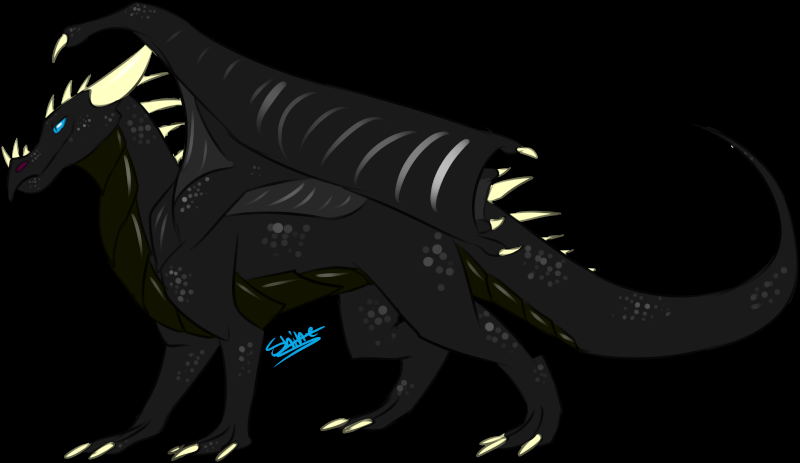 She was most likely on the smaller end of them with her SkyWing heritage. How could this one be able to stand on a higher branch if it was a NightWing? Sure, it could have been a hybrid like her, but even then most if not of her siblings were guaranteed to be larger than her. Dynamic had opened her mouth to reply when she heard the beating of wings. Another creature had flown itself up to the height of the other one. Its husky voice asked her why she was hiding, and why in a tree. Aero stared at the new creature. She had never seen something like it before, with its mane of fur, dangerous tail, and almost dragon-like wings. The dragoness waited, almost wondering if the creature had spotted her. She glanced back up the tree to the spot where she assumed the other to be. If she really was a NightWing, that had to have been one brave creature to fly up and directly ask it. She stayed quiet for now, watching how this would play out. Shiera was really beginning to regret making her way into this tree in the first place. The way she was positioned, it was beginning to become uncomfortable on her hindlegs. She flicked her tail a bit, trying to back her body up so she could move herself into a more comfortable position. This, however, backfired, only succeeding in making her even more uncomfortable. And all of this while still holding her prey item, the deer, which was continuing to taunt her by dripping blood to the lower branches and bushes below. It was certainly unnerving to be cornered. It made her mildly annoyed, as well. Why was this stranger so curious as to who she was? She was being awfully outgoing and loud for a rogue. Didn't she know how NightWings could be with rogue? It made no sense. Then again, on one paw, Shiera hadn't confronted the stranger like most Nightwings would have done, so perhaps that was a give away of sorts as to a false act. Though it certainly wasn't comforting to think the she dragon had doubts. In fact, it made the whole horrid situation probably a dozen times worst. She nervously bit her lip, trying to peer through the trees to get a good look at the dragon's expression. Did it portray doubt? Shiera hoped she didn't have to explain herself. Her claws would scratch along the wood, her shoulders squared. She was quite stressed. But she would try to compose herself until she actually heard the dragon speak. That was when a sudden strange smell flooded Shiera's senses. A smell so strange yet strikingly familiar, she momentarily forgot her predicament. The smell of a manticore. Even though she hadn't seen her family in over six years, it was still unmistakable. It was slightly different from the manticores she had grownup with, but was still similar nonetheless, and still screamed manticore. Shiera began to look around frantically to locate the stranger. She didn't have to look long though, as she spotted a flash of movement between the branches. Glancing to her left, she watched as a much larger, much older manticore flew up to meet her. She instinctively flinched back, but was also quite intrigued at seeing another one of her species. After all, from what she knew, the manticores were just as endangered as the EarthWings, perhaps even more so. It was a very unusual circumstance to see two of them together. However, she was quickly brought back to the reality of the situation when the older male asked her what she was doing. Shiera winced. The dragon had noticed him, as well, and he was rather loud. She turned to him, giving him a sort of passive warning in her eyes. "Hiding from the dragon, what does it look like?" she hissed over to him in a whisper, hoping he would be close enough to hear her. And also hoping the dragon down below wasn't close enough to hear. 'Hiding from the dragon'... The Manticore's upper lip curled slightly in a silent snarl. What Manticore would be afraid of the overgrown lizards? "Why? Can you not defend yourself? Do you hide from an EarthWing?" At least that would be understandable... a Manticore's toxin had no effect on the largest of the Dragons and they were just about as strong as the winged felines, too. The young manticore gave a soft scoff, flashing a glance at the older manticore that clearly conveyed are you being ridiculous right now?. But her attention quickly returned to the dragon beneath her, her claws tensing ever so slightly as they held her to the tree, her tail coiling carefully around the trunk as her body began to get more and more stressed. "Do you have any idea how dangerous a dragon is? She'll probably kill me on the spot! Plus, she thinks I'm a dragon right now, so play it cool!" Shiera hissed through her teeth at the manticore hovering a couple feet away from her. She was a tad stressed at the moment, so she wasn't on her best behavior. She tried to stay as quiet as possible, so the dragoness below them wouldn't hear what the two manticores were conversing about.